Profusely punning his path through his 26th Xanth fantasy, the prolific Anthony (The Dastard, etc.) focuses on a contest between Demon Jupiter and Demon Fornax, reviving to great effect the dueling demons theme from last year's Swell Foop. Believing a piece of Mundane Snail Mail has provoked Demon Jupiter to hurl his red spot at the Demon Earth (which could result in the obliteration of Xanth), Umlaut, the story's hero, sets out with Sesame Snake and Sammy Cat to consult the Good Magician. To avert tragedy, they must deliver the letters that remain from the Snail Mail left at the Zombie Castle. 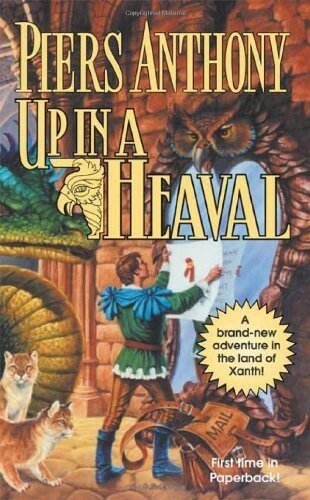 As they crisscross Xanth, they encounter many of the characters featured in Anthony's previous works. To add depth to the plot, the Demoness Metria appears regularly to tempt Umlaut from his path using raging hormones and the "Adult Conspiracy" theme that salts all the Xanth novels with schoolboy humor and sophomoric jokes. Anthony's latest offering is certain to please fans. New readers, however, may lack the patience to plow through so many puns and so much childish humor.